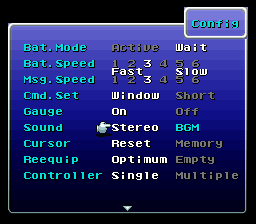 This hack implement a music player available from the Main menu or Config menu. 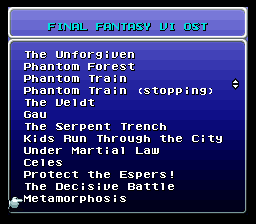 This code is heavily based from FF6-T Edition implementation of the music player which used the same idea as Pandora’s Box in terms of menu layout and maybe actual coding. 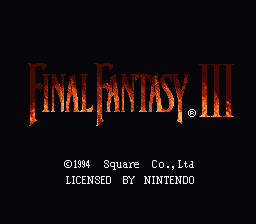 A FF6j ASM file was shared in 2014 by FF6-T creator Tsushiy. 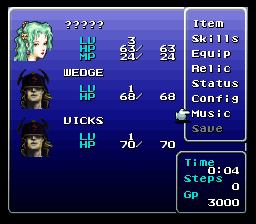 Referencing the good FF3us functions and doing menu changes was all left to do to implement the music player core code in FF3us. Pandora’s Box did it first so this team deserve much credit at the very least for proving that such a feature was possible as early as 2008. 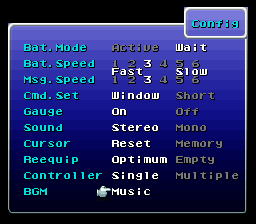 If you want to change you song titles or the order / number of entries in the player, edit the mplayerdata.asm file then assemble either ff6_music_main.asm or ff6_music_config.asm with xkas 0.06. More implementations should follow, probably implementations made for the optimized $C3 bank made by Novalia Spirit.